We’re Revolutionizing The Way People Get And Stay Healthy. The M.O.G. Makes Exercise Accessible – And Enjoyable – To Anyone. Once you’ve joined the M.O.G. community, our programs and classes will be seamlessly integrated into your practice’s operation; offering a proven way to retain and expand your referral base, while improving outcomes. Programs range from individualized workout routines for the average member to specialized Exercise Treatment Plans for those with specific medical diagnoses. Group classes vary from exercise designed for those who require special attention, to classes based on age and interest – encompassing everything from M.O.G. Kids to T’ai Chi for Parkinson’s. 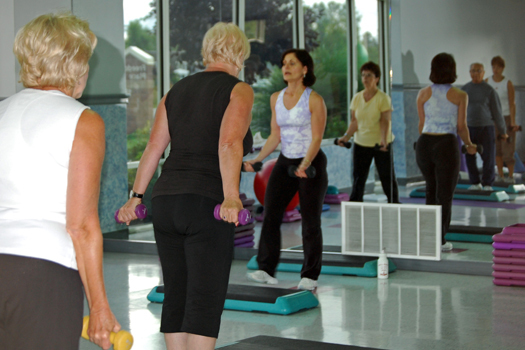 Collected data shows patients who participate in a supervised exercise program through M.O.G. experience a $4000 reduction in immediate health care costs over a one year period. We understand the importance of the bottom line – not only do you want a quality product but you also expect results. In a collaborative study, BlueCross BlueShield calculated a return on immediate investment for the payer of healthcare of 3:1*. This study did not take into consideration other factors, such as: lower absenteeism, improved productivity, or downstream cost savings. With the movement towards value based reimbursements the MOG model is setting the standards for higher payments to providers for better medical management of chronic disease and complicated patient care. *Data from a study conducted in partnership with Blue Cross and Blue Shield of Western New York, Sheridan Medical Group and the M.O.G. evaluating 102 insured individuals categorized as High Cost/High Risk (HCHR) as defined by multiple chronic co-morbidities. We believe it is possible to engage a single person in prioritizing their health and happiness. We can change our culture.